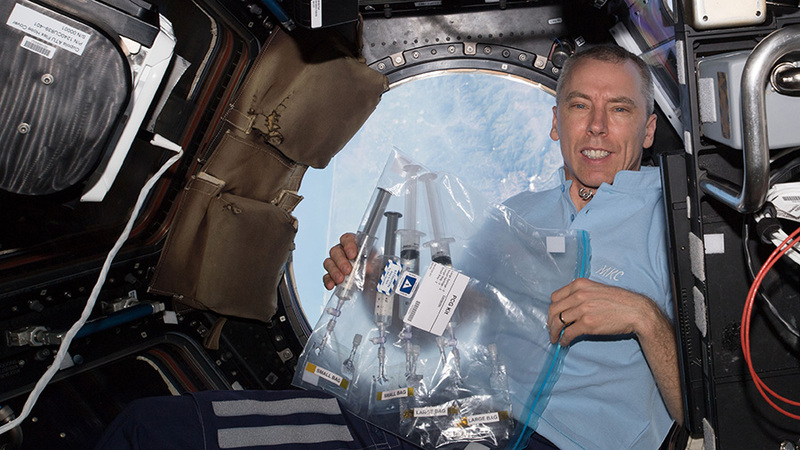 Flight Engineer Drew Feustel holds a bag containing samples that had been collected, documented and inspected for the Protein Crystal Growth-9 experiment. The Expedition 55 crew members are packing up the SpaceX Dragon cargo craft today for its return to Earth on Wednesday. Meanwhile, the six International Space Station residents continue operating a multitude of space experiments while ensuring the orbital lab remains in tip-top shape. NASA astronauts Scott Tingle and Ricky Arnold transferred an array of biological samples from station science freezers to specialized freezers stowed inside Dragon. The research samples are for analysis by scientists and are among a variety of cargo, including station hardware for refurbishment, returning to Earth inside Dragon Wednesday. NASA TV begins its live coverage of the Dragon departure at 10 a.m. EDT on Wednesday. Robotics controllers on the ground will command the Canadarm2 to release Dragon at 10:22 a.m. Tingle will be in the Cupola monitoring the release and departure activities. Dragon will fire its engines for the final time at 3:06 p.m. beginning its descent back into Earth’s atmosphere before splashing down in the Pacific Ocean around 4 p.m. NASA TV will not cover Dragon’s splashdown about 260 miles southwest of Long Beach, Calif. Flight Engineer Drew Feustel tended to a variety of experiment hardware today supporting life science and biomedical research. He spent the morning working on the Multi-Use Variable-G Platform that houses tiny organisms such as fruit flies, flatworms, plants, fish and cells. Feustel then configured the Human Research Facility-2 with gear enabling ongoing observations of the physical and mental changes taking place in astronauts living in space. Next Next post: What Does It Take to Keep the Station Stocked With Supplies?